The perfect baby book for new moms and dads! Baby expert Gina Ford comes to the rescue with her newly revised hour-by-hour, week-by-week guide. One of Great Britain’s top parenting experts, she draws on more than twenty years of experience researching and studying the natural sleep rhythms and feeding patterns of babies to ease the stresses and worries of new parents. 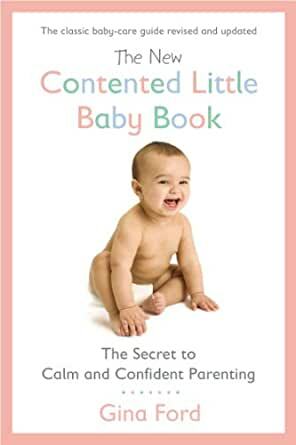 In this new edition, you’ll find everything you need to know to get your newborn to sleep through the night. In addition to advice on sleep training, Ford shares her expertise on feeding schedules, colic, crying, teething, illness, pacifiers, separation anxiety, and setting up the perfect nursery. With this easy-to-follow guide, Ford will have your whole family sleeping through the night—happily and peacefully—in no time. 4.0 颗星，最多 5 颗星Suits our personalities. Not for everyone. Had this book recommended by some friends who swore by the general concept. Having witnessed how their children are and how they sleep we were keen to give it a go. By and large I love the structure that it advocates. My wife has joined a mother's group in the area and has seen firsthand how miserable some of the mothers are that have little to no structure. Babies awake throughout the night. Feeding at all times of day and night months down the line. Our experience has by and large been very good. The structure gives us a feeling of control and stability. Without it I think our household would be far more anxious and chaotic. When you are sleep deprived, emotionally exhausted, recovering from a major body trauma and your brain just isn't working how it should do, it really helps to have a framework to fall back on. A manual of sorts. It isn't easy. It doesn't work all the time. But having a structure and essentially pressing a reset button every day is very comforting for everyone involved in this brand new relationship. I don't think we could follow every little detail in the book and have tried to remain a bit flexible. But the routine and structure helps both us and the baby, so it is a win win there. Sure, it ties you initially to being at home for the baby's nap times which may curtail your outings somewhat. But we found that ensuring our little one gets the right amount of wake/nap time during the day means we all ultimately get a good nights sleep. That is a sacrifice we are very happy to make. We have veered off the philosophy a few times, wanting to take the little guy out and about on long day trips. The end result was some sleepless nights and us chipping away at each other for a day or so afterwards. Nobody was happy. Ultimately only you will know if this sort of thing suits your personality and if it doesn't then that's totally understandable. It's not been easy at times but having stuck it out we've definitely noticed some good results. The little man is becoming more and more predictable in his feeding and sleeping patterns by the day. Time will tell if it pays of the way we think it will. We have some real world examples of friends that have done it this way, and those that have not. And the picture of the families that have followed the Gina Ford method is definitely one that we prefer. Whichever direction you choose good luck!!! When it comes to setting up a routine for the baby and helping them to sleep, this book was by far the best. Initially, I found the routine to be very restrictive and a pain to follow. I only started my baby on her recommended schedule when my baby was around 12 weeks old, given he was born as a late preemie at 36 weeks. It took at least a couple of weeks to even be able to follow the first phase of the set routine. However, a friend of mine swore by this method, so I stuck with it. Our baby started sleeping through the night (11 hours) by the time he was five months old. When he was four months old, he still woke up two to even four times a night, so I was convinced this method wasn't working. Then, somehow it just happened. He started dropping his night feedings one by one... The routine set for the baby makes intuitive sense and makes sure he/she doesn't get overtired. My baby is now almost 7 months old, but he still sticks to the basic schedule Ms. Ford sets out. He is never awake for longer than three hour stretches and loves the routine. She also encourages the baby to fall asleep on his own and that makes all the difference. Many of my friends still have a lot of difficulty getting their baby to sleep - all I can say is that getting your full night's sleep back, is absolutely a luxury. This is really the only book you need to help your baby sleep. 5.0 颗星，最多 5 颗星She’s still sleeping 12 hours a night at age 4! When I first received this book as a gift, I objected strongly to its premise of scheduling. But once I was a sleep deprived mom sobbing in the middle of the night with my hungry newborn, I gave the schedule a go. That little monkey is nearly 4 years old now and still sleeps 12 hours a night. She goes to bed at 7 every night and we parents are free to do grown-up things. This book not only saved our sanity with a newborn, it also saved our sanity through the toddler years. I’m a stay at home mom. I bought this book in June 2014 when my baby was 4 months old and a terrible sleeper. According to the book she was on a 2 week old baby schedule. So I gave her 1 week to catch up to the 4 month old schedule (the book suggests being nicer and moving them up slower but I was EXHAUSTED!!!) By the end of the week she was going to sleep EASILY and waking up happy/contented, just wake up coo until I came in to get her. I’ve used this book on a total of 3 babies born 2014, 2015, and 2017. All of them are fantastic sleepers to this day (April 2018). Baby born 2017 is now 7 months and taking well to the schedule. He’s sleeping through the night according to the books definition. Nap time is easy. He goes down and when he wakes he’s happy to hang out in the crib till I come to get him. I did and do arrange my life around the schedules in this book. It is tricky in the beginning but TRUST me it’s worth it in the end!! Gina Ford gives lots of troubleshooting tips. Use them when you are stumped. Listen to your intuition. If something is not working for you adjust it a little to fit. I used the book as a general guideline but ultimately went with my gut. For example: around 6 months the lunch time nursing is stopped and replaced with food. I always still nursesd and followed up with food. I was nervous about my supply dropping. Non-negotiables for me were: never rock the baby to sleep. Never nurse the baby to sleep. However, I am NOT opposed to using a paci only at bed time if you are having an especially difficult time. 2 of the 3 babies I used this book ok took a pack at bed time. But it was not allowed out of the crib. **I have a total of 4 babies. My first was NOT a good sleeper. She was born 2012 and when baby #2 came in 2014 I was terrified of another BAD sleeper. So after my first was born I used this book on the next 3 babies with fantastic success.